Mary M. Rhody, 83, of Schuylkill Haven, passed away Wednesday, March 20, with her family by her side. Born in Pottsville, June 7, 1935, she was a daughter of the late John H. and Kathryn Devlin Hanney. She was the widow of Gene Kenneth "Geno" Rhody, who preceded her in death on July 11, 2018. In addition to her parents and husband, Mary is preceded in death by her sister, Patricia Cleary. Mary graduated from St. Stephen's High School. She also graduated from Misericordia University's Nursing Program. Mary was employed as a registered nurse for the former Good Samaritan Hospital, Pottsville. She worked as an emergency room and operating room nurse for 33 years. She was a member of St. Ambrose Roman Catholic Church, Schuylkill Haven. She volunteered her time with the St. Ambrose PTO and CYO. Mary also belonged to the Golden Oldies Club. Mary had a happy disposition; and was always smiling and singing. Devoted to her family, Mary made everyone feel unique and special. She told her loved ones often, "I'll love you more than you'll ever know." Mary is survived by four sons, Michael Rhody and wife, Laura, Andrew Rhody and wife, Eileen, Robert Rhody and wife, Michele, and Thomas Rhody and wife, Kimberley; two daughters, Barbara Doyle and husband, John, and Linda Fryer and husband, Rick; 18 grandchildren, 16 great-grandchildren with another on the way; nieces and nephews. A viewing will be held from 5 to 7 p.m. Sunday at Geschwindt-Stabingas Funeral Home Inc., Schuylkill Haven. A Mass of Christian Burial will be celebrated at 10:30 a.m. Monday at St. Ambrose Roman Catholic Church, Schuylkill Haven, with the Rev. Edward S. Zemanik officiating. There will be no calling hours at the church prior to Mass. Interment will immediately follow Mass at Schuylkill Memorial Park, Schuylkill Haven. 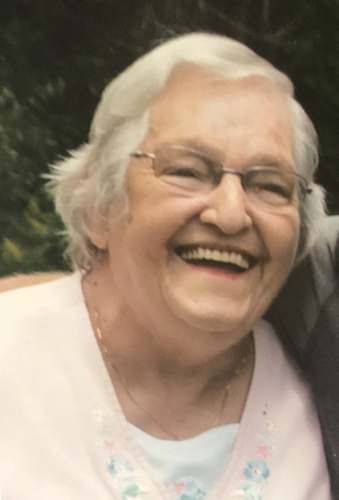 At the family's request, donations in Mary's memory may be made to Alzheimer's Association , South Central PA Chapter, 2595 Interstate Drive, Suite 100, Harrisburg, PA 17110, or St. Ambrose Church Memorial Fund, 201 Randel St., Schuylkill Haven, PA 17972.